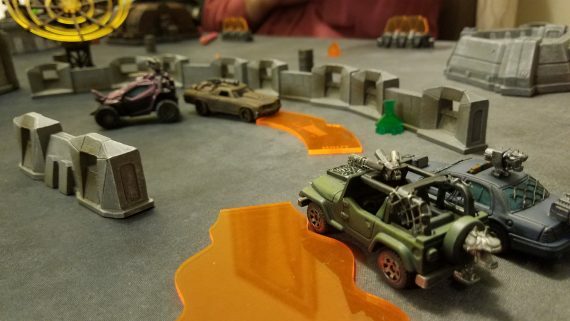 AAR- Checkpoint Bravo: Gaslands Race! 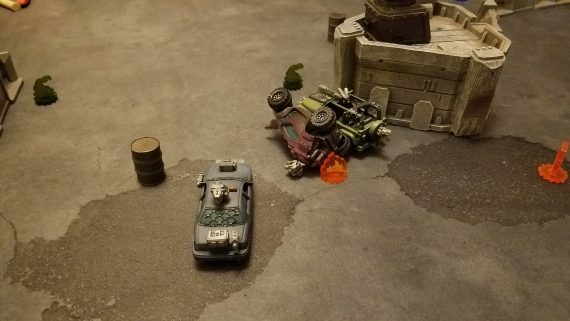 I must say, this Gaslands game is making waves. The initial book printing sold out, and has since been reprinted. 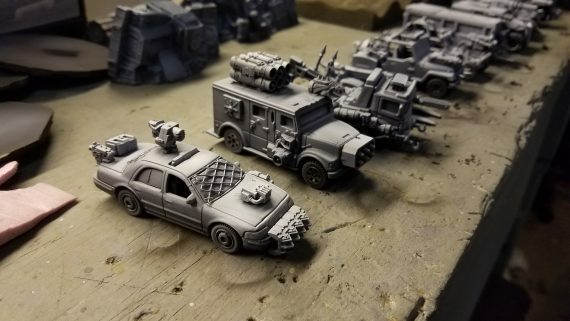 Apparently, lots of gamers are excited about souping up their vehicles and bringing their favorite pulp apocalyptic death car movies to life! Well, not real life, in which the people on Chicago highways already seem to do...but miniature scale real life! On our first road test, we all saw the potential of the system. The rules are thematic, and easy to follow, but also gamey enough to inject some clever tactical decisions. 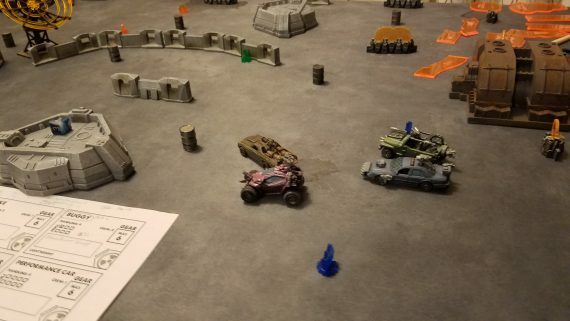 In our second match, we decided to try a racing scenario, since cars also like to move fast when not shooting and smashing in to each other. I had some worries about how a race would play out. If the course wasn't set up properly, would it just turn in to a bout of pure chaos, regressing in to yet another deathmatch? Well, from our test...no. But also, kind of? 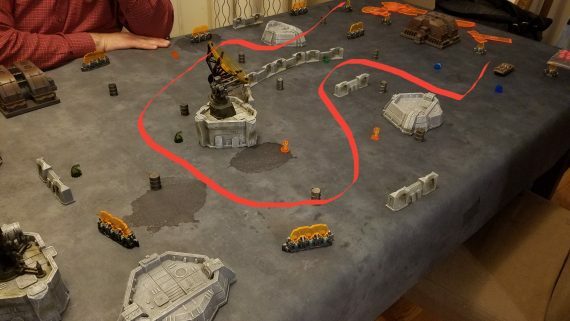 We had a fairly large gaming mat to set up on. This was a 6x4 double sided mat from Urbanmatz. 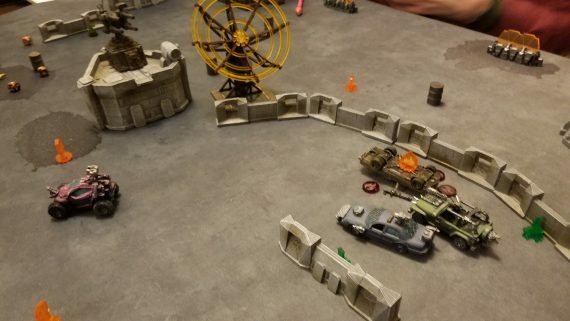 We chose to use the asphalt side to give it a dystopian urban deathrace feel. 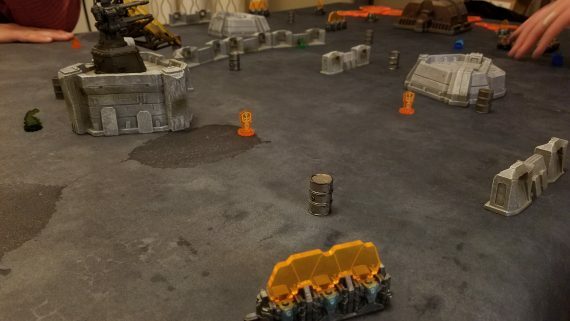 Most of the 15mm terrain was from gamemat.eu, which worked out great defining the general structures of the course. I chose a singular, curved course path, generalized to a long narrow U shape. The gates were marked with the matching colored pairs of tokens making the course path easily distinguished by the players. I had a genuine curiosity if this path would be too short, with cars easily zooming past each other and crossing the finish line. 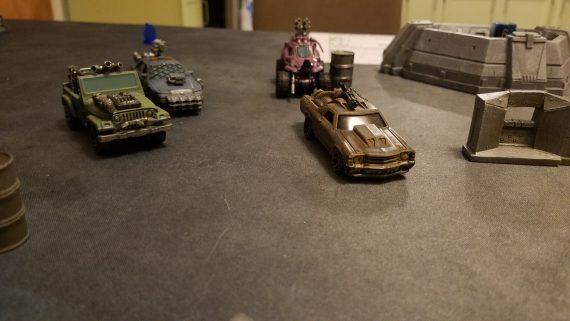 But, alas, we are wargamers...and our cars come speckled in guns and spikes!!! That is indeed correct; we were vicious, and devious from the starting line! The flag was dropped and all of today's racers sped forward, their eyes glaring towards the first gate. Weapons are deactivated until one passed through gate 1. I think we all focused on this, and as soon as we passed, guns fired up with our crews taking potshots at each other close quarters. Truly a no mercy experience. The gates were also set up in such a way that the race path narrowed a bit, ensuring there was some maneuvering chaos. In retrospect, I might have made gate 1 a little TOO narrow, causing lots of collisions early. As a learning experience however, this forcefully answered a lot of questions our first game did not. There were major hazard accumulations, wipeouts, smash attack collisions, sideswipes, glue droppings; all very early so we got to see how some of these mechanisms worked first hand. This really drove home the screw-you aspects contained in this thin blue rulebook. 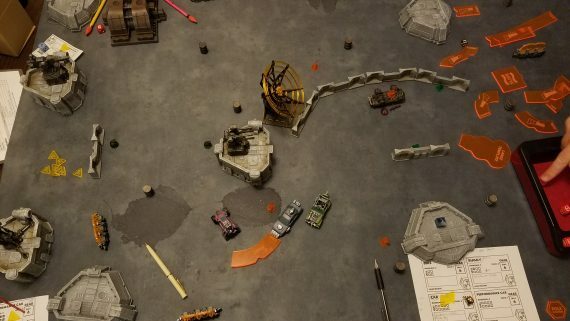 One particular wipeout, as Karl sped ahead, was of particularly bad timing, because one of the wipeout rules is that an *opponent* gets to reorient your facing afterwards! Tim, underneath his ever- friendly demeanor and with a twisted smirk on his face, rotated him facing us! Gah! Guaranteed collisions in the next turn...and you KNOW it's going to happen. We got your collisions, right here! And you know what, you're not mad about it. It captures that sadistic world this game takes place in. Perhaps, ~too~ well. So, early collisions and a gate blockade gave Tim a fairly early lead. Karl, smashing in to us and getting shot up wound up getting wrecked within a few gear turns. Alas, Karl, we hardly knew ye. Now we had some room to swerve and catch up to Tim. Oh, I forgot to mention those barrels strewn about the course are volatile, explosive obstacles! This made navigating the course even more tricky at high speeds as they could damage wreckless vehicles. 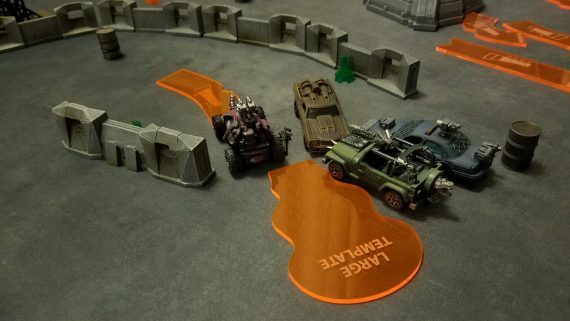 Tim found this out the hard way, and wiped out due to accumulating hazard tokens. Note for the future: wipeouts in a race are baaaad! Terrence, coming to get you Tim! 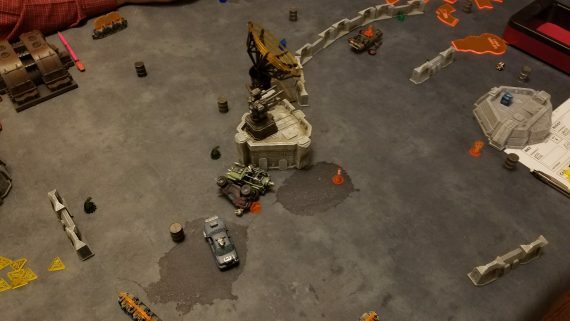 As we caught up to Tim, our weapons unloaded and Tim wound up getting wrecked as well. 2 down. One more to go, roughly halfway through the course. Since this was a further trial game, we called it here since we didn't want 2 players uninvolved. Was it fun? Heck yeah! I'm not the biggest racing fan. 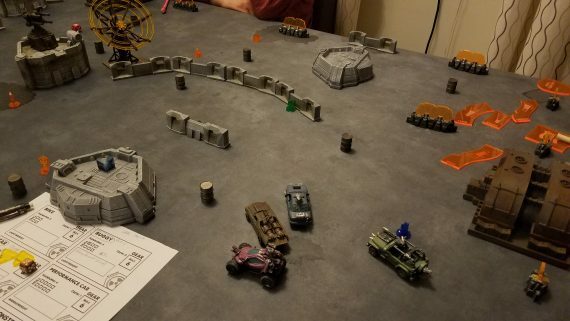 I'll play an occasional board game utilizing the theme, but a minis racing game isn't exactly in my wheelhouse. 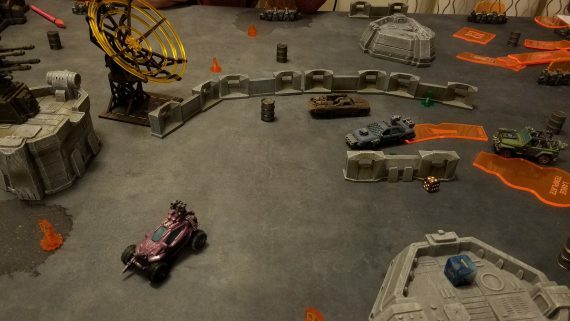 However, the oh-so-dastardly ruleset for this game and the freedom to make DeathRace2000 a real thing is quite compelling! 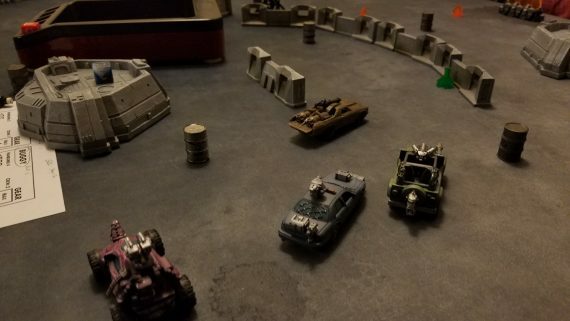 In preparation for this game, I even modded out those hotwheels I bought to try the game in the first place. 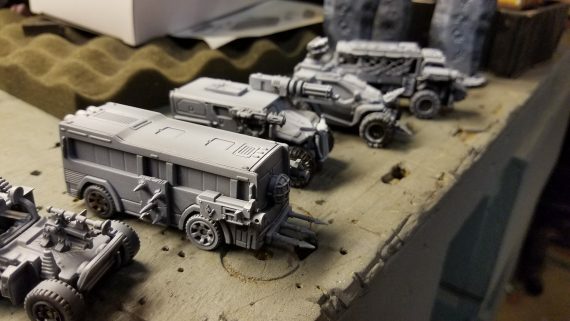 I dug out an old 40k bits box, and did some cut&paste, reprime and base color these vehicles. It was a quick process, and felt great not having any real restrictions during the creation process. 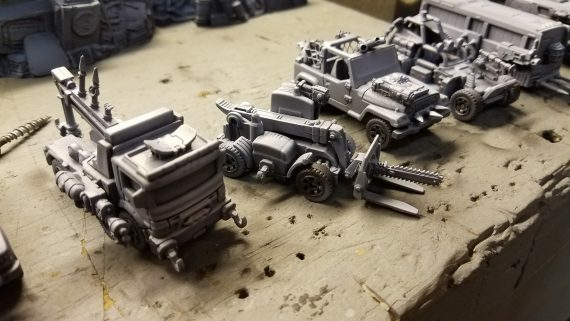 Just make some rad, menacing looking cars ready to win at all costs! Need to work that bus in to a scenario. Like a post apocalyptic "avoid raiders to get kids to school" scenario! Some possible worries about this scenario: is getting the lead early bad? 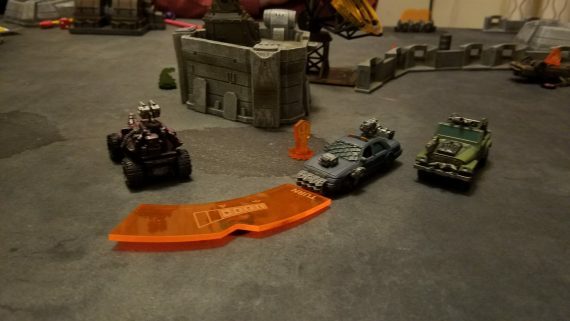 With all of the cars behind you, would this just make you the obvious target of their front mounted weapons? 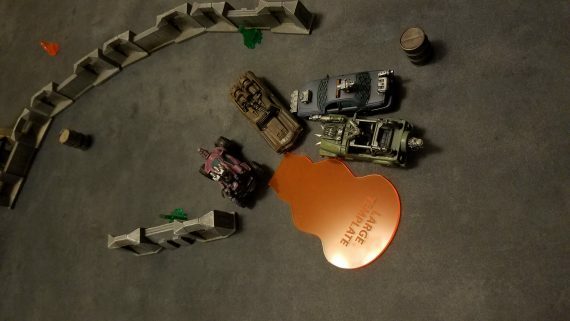 Perhaps you definitely need a front AND rear mounted weapon in a race scenario for maximum benefit. 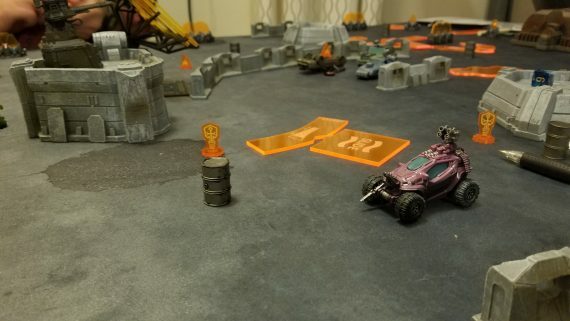 The game went by much faster this time because we only controlled a single car. But the cars died REALLY quickly this time as well. If this were a 6 player scenario, you could possibly have a lot of people eliminated and becoming spectators. How fun that is, is up to your group. I don't mind it, but know some people in our group are very conscious about engaging the people attending the meetup. The fact that I have those questions is, in my opinion, very much a positive thing. I'm thinking about the game. I'm thinking about ideal/cool course set ups. Multi-tiered beasts with lots of interaction filled sections. I'm looking at oddball hotwheels with a new eye. "Ooh, I could mod that in to something amazing!" Forklift with a chainsaw??? Ya darn right! This game really belongs in that "uber demo game" category because of it's simplicity in teaching and thematic standing. Can't wait to try it some more. Awesome templates, btw. They really give a sense of motion in pics.